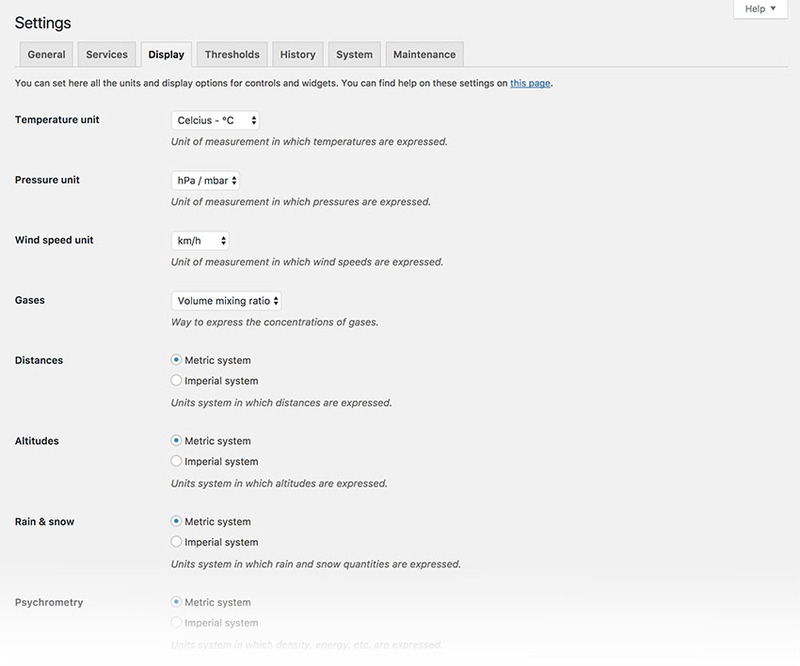 The display settings tab allows you to adjust all the units and display options for controls and widgets. This tab is visible only if Weather Station runs in extended mode. Weather Station internally store and manipulate data in the International System of Units (MKSA). But you can specify the units in which data are expressed when rendered to screen (i.e. in controls and widgets). So, for temperatures, pressures, wind speeds and gaseous concentrations, you can set the unit in which you want to display it in controls and widgets. For distances, altitudes, snow and rain amounts, you can specify in which system of measurements to display it. When collecting meteorological data from stations, Weather Station computes some indexes like heat index, humidex, wind chill, dew and frost points, etc. If you want these types of values to be excluded from the displays, you can do it by unchecking this option. The icons displaying wind in widget can shows the direction of the wind or the source of the wind flow (like a wind vane), to select which mode you want, just check towards or from checkbox. By default, gauges boundaries are fixed by the thresholds values. You can override this behavior by letting Weather Station calculate a “best range” based on the measured values. To do so, just check the option “Adjusted whenever possible”. Each collected weather data has an associated timestamp (the date and time at which is was measured – not collected). If you want that a data with an old timestamp shall not be used in displays or computations, you can set the amount of time beyond which this data is considered stale. If you choose never for obsolescence, the data will never be considered stale.